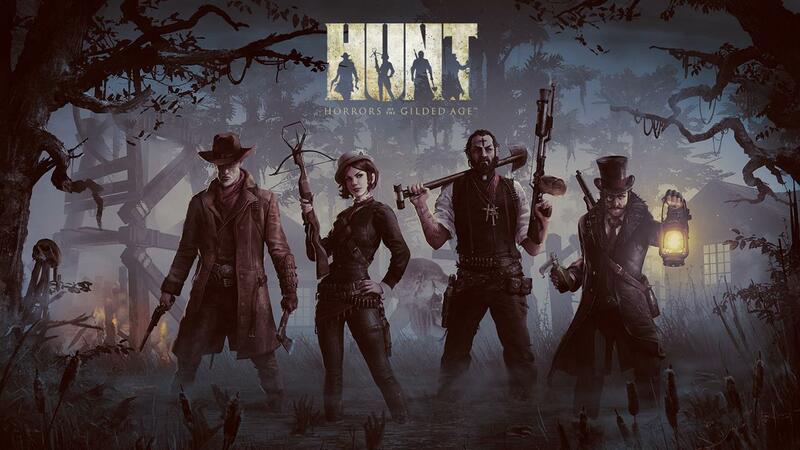 Crytek wrote: Brace yourself for a spine-chilling new multiplayer experience on PC and consoles as Crytek ventures into the shadows in "HUNT: Horrors of the Gilded Age". David Adams, CEO of Crytek USA Corp., said: "In HUNT: Horrors of the Gilded Age, players will be counting their bullets and crying out for help as they delve deeper into the shadowy world we've created. From the outset of the development process, we've poured our imaginations into the game so that everyone who plays HUNT will discover a challenging experience that feels fresh, captivating and rich in possibilities." Set in the late 1800s, HUNT depicts a world where so-called myths and folklore actually point to the terrifying truth about evil lurking just beyond the fringes of day-to-day life. Players act as hunters willing to take up arms and risk their necks by venturing into the deadliest of territories and facing the hideous creatures that have overrun them. Adding to the thrill of the hunt is a special content generation system that ensures players never encounter exactly the same environment or set of enemies twice. As the surprises come thick and fast, the terror of knowing that one of the game's grueling boss battles could be just around the corner will keep everyone's pulses pounding. Defeating bosses will require close collaboration between hunters as they attempt to figure out and take down some truly terrifying monsters. Wesley Yin-Poole wrote: Meet Hunt: Horrors of the Gilded Age, the first game from Crytek USA, which was created by Crytek after it, for all intents and purpose, saved Vigil from its own apocalypse. It's a third-person action RPG with, you guessed it, four-player co-op. Is it the game Darksiders might have been? "We definitely wanted to do four-player Darksiders," Crytek USA CEO David Adams tells me over Skype, reminiscing about those press tours in which he was often asked, as boss of Vigil, when are you doing four-player Darksiders? "One of the first things we said when we got here was, we are absolutely doing a four-player co-op game. That wasn't even up for discussion. It was like, okay, here's one absolute we can all agree upon, and go from there. It's been fun to finally make something like that." "The creature variety in Darksiders was pretty insane. We had 50 or 60 unique characters. And that's not something most people do. You look at shooters or something like that and if you really tally up the enemy count you get to maybe a dozen, and that's pretty typical. We built up quite a bit of expertise on how to build these things quickly and iterate them and get them to a playable state. So we built a game that's designed around that - hunting bosses, killing creatures." If Hunt's announcement trailer reminded you of Ready at Dawn's PlayStation 4 exclusive The Order: 1886, by the way, it's a comparison Crytek USA is aware of. It's an odd one: you wait forever for a game set in the late 1800s then two turn up at once. There's that Penny Dreadful TV show, too. I should probably say something about buses here. While they're both over the shoulder shooters set in the late 1800s, the similarities between Hunt and The Order stop there, Adams insists. "They're actually two completely different games. As time has gone on I've seen a wide diversion, especially on the focus of the gameplay. Even the style of the time period. Theirs is more like the BioShock version of the 1880s. Ours is actual authentic 1880s. And then the focus on co-op is a huge difference. It's just a completely different game." This, it seems, is an edict that comes down from upon high by the bosses of Crytek. Crytek boss Cevat Yerli has in the past insisted that all future games self-published by Crytek will be free-to-play. "We made boxed retail games, then we came to Crytek and the first thing they said is, hey, we want to move into free-to-play," Adams explained. "Our approach has always been, we're just going to make a game," he says. "If we made this game anywhere else we would sell it for $60. We're just making the game as if we were making a retail boxed product. In our head, our goal is people see it and go, I would totally buy that game for $60. That looks amazing. That looks like any other game on the shelf, but, you get it for free." I stumbled onto a guide on Steam that helps you improve at the game without spoilering it much, while at the same time bringing out the unique play styles that the game's innovative mechanics (both core and progression) encourage. Have a read. I bet you'll feel impelled to buy in if you haven't already.